Limestone is an odorless white, grayish-white or tan material that ranges from sized stone to a granular powder. It is often described as the most versatile mineral. Limestone is the name given to any rock formed which consists mostly of calcium carbonate (CaCO3), but to geologists, limestone is only one of several types of carbonate rocks. These rocks are composed of more than 50 % carbonate minerals, generally containing the mineral calcite (pure CaCO3). Limestone is a sedimentary rock composed mainly of CaCO3. It is formed by the deposition either of the skeletons of small creatures and/or plants (organic limestones), or by chemical precipitation, or by deposition of fragments of limestone rock, on the beds of seas and lakes. Limestones are contaminated to a greater or lesser extent by the deposition of sand or clay which is the source of the impurities usually found in the limestone. Generally there is a difference in quality in a deposit from one layer to the next. The purest carbonates and the most suitable from the production point of view tend to be the thick bedded type. Carbonate deposits may be found in horizontal layers as deposited, or at an angle from the horizontal due to earth movements. They will vary in density, hardness and chemical purity. Limestone rocks are extremely common and make up a significant portion of the crust of the Earth. They serve as one of the largest carbon repositories on our planet. The properties of limestone make it one of the most widely used minerals. Some limestones may contain small percentage of magnesium carbonate (MgCO3). These limestones are known as dolomitic limestones. Impurities (such as clay, sand, organic remains, iron oxide, and other materials) cause limestones to show different colours, especially with weathered surfaces. Limestone besides CaCO3 and some amount of MgCO3 contains varying proportions of silica (SiO2), alumina (Al2O3), iron oxide (Fe2O3), sulphur in form of sulphide or sulphate, phosphorus in form of P2O5, potash (K2O), and soda (Na2O). The two main impurities are silica and alumina with iron as the third. The characteristics of mined limestone are dependent upon the attributes of the deposit from which the limestone was extracted. Each limestone mine is able to offer a range of products unique in dimensions, colour, and structural properties to its deposit. Limestone is sparingly water soluble. However, most natural water contains high levels of carbon dioxide. This increases the solubility of the limestone as follows. Firstly, the dissolved carbon dioxide reacts quite readily with water to form bicarbonate (HCO3) and hydronium (H3O) ions. In these acidic conditions, the carbonate then reacts readily to form bicarbonate. Commercial limestone rock generally used for calcination consists of over 90 % calcium carbonate and contains voids. This voidage is almost exclusively in the form of larger pores, with few micro-pores. The limestone from the various deposits differs in physical and chemical properties and can be classified according to their chemical composition, texture and geological formation. Limestones from different sources also therefore differ considerably in chemical compositions and physical structures. The chemical reactivity of various limestones also shows a large variation due to the difference in crystalline structure and the nature of impurities such as silica, alumina and iron etc. The varying properties of the limestone have a big influence on the processing method. Hence it is necessary to know comprehensive information of the limestone such as physical and chemical properties before taking a decision n its processing. Limestone mainly consists of mineral calcite. 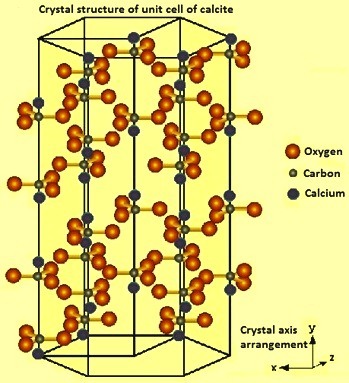 The crystal structure of unit cell of calcite is shown in Fig 1 and its main properties are given in Tab 1. 16 Fracture Conchoidal but rarely seen due to perfection of cleavage. 21 Crystal habit Crystalline, granular, stalactitic, concretionary, massive, tabular, prismatic, acute or obtuse rhombohedral and scalenohedral. 22 Crystal forms and aggregates Crystals common and very varied in habit, more so than any other mineral. Calcite also occurs as parallel or fibrous aggregates or as granular, stalactitic or massive aggregates. 24 Solubility Practically insoluble in water (solubility in water – 0.13 grams/litre) and in alcohol. Solubility improves when CO2 is dissolved in water. Dissolves with effervescence in diluted acetic acid, in diluted hydrochloric acid and in diluted nitric acid. . The CAS number of limestone is 1317-65-3. Limestone has a basic characteristic with pH value in the range of 8-9. It is an inflammable solid. Limestone when heated starts decomposing into lime (CaO) and carbon di-oxide (CO2) at 810 deg C. The process is called calcination of limestone. It is a thermal treatment process which is carried out for the thermal decomposition of the raw limestone for the removal of LOI (loss on ignition) or carbon di-oxide (CO2) part of its composition. Calcination process consists of an endothermic reaction which is carried out in the solid state. The product of calcination of limestone is quicklime which mainly consists of CaO. During the calcination of limestone, since CO2 is removed, the lime (i) is porous (ii) has higher surface area, (iii) has high reactivity, and (iv) is hygroscopic. Calcination of limestone, since an endothermic chemical reaction, requires considerable input of energy. When limestone is heated, the calcium carbonate is decomposed as per the following equation. Around 1.8 t of limestone is required to produce 1 t of quicklime. The quicklime is not stable. In the presence of moisture, lime reacts slowly with carbon dioxide in the air, reforming calcium carbonate. Further because of its hygroscopic nature, it absorbs moisture from the ambient air. With the absorption of moisture, it starts losing its reactivity. Since quicklime has a high affinity for water it is an efficient desiccant. The reaction of quicklime with water is associated with an increase in volume by a factor of at least 2.5. As quicklime is a chemically active material, it is desirable to reduce its atmospheric exposure during handling and storage to a minimum. Reactivity of lime is its activity for hydration and is the relative capacity of lime to reciprocate chemical change with water. Reactivity is a function of purity, particle size and other factors such as particle porosity. The slaking rate is a measurement of the time for the slaking process to reach completion. The reaction is considered complete when the temperature of a given sample reaches a maximum. As reactivity increases, the slaking rate, ultimate temperature rise, and surface area of hydrated lime increases also. Quicklime is expected normally to show high reactivity. A large number of pores exist on the surface when the quicklime has high reactivity and when it is very porous. Temperature and time of calcination play an important role in the reactivity of quicklime. The reactivity of quicklime is also dependent on the homogeneity of lime, the degree of thermal decomposition of limestone, and the specific surface area the quicklime. The reactivity of quicklime is determined by taking 12.5 grams of sample of quicklime of size 1 mm to 3 mm grain size. The lime sample is digested in around 100 ml of water at 60 deg C. Two drops of methyl orange are added and the solution is titrated against 4N HCl. The end point is when orange colour turns to pink. The volume of HCl consumed is multiplied by 4. This value indicates the reactivity of quicklime. 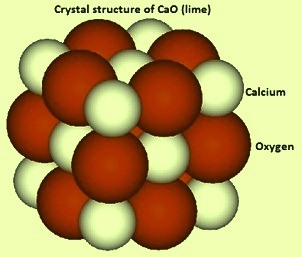 Crystal structure of CaO (lime) is shown in Fig 2 and the important properties of lime are given in Tab 2. The CAS number of quicklime is 1305-78-8. Quick lime has basic characteristics. The process of adding water to calcium oxide to produce calcium hydroxide is referred to as hydration process or lime slaking. The hydration process, when done with just the right amount of water for chemical reaction, is called dry hydration process. The product of dry hydration process is hydrated lime which is a dry powder and in which the oxides are converted to hydroxides. If excess water is used for hydration, the process is called slaking process. In this case, the resultant hydrate is in a slurry form. The slaking process is normally carried out with considerable excess water ranging from 2.5 parts to 6 parts of water to 1 part of CaO. Dry hydrated lime is generally produced from high calcium quicklime and contains 72 % to 74 % calcium oxide with 23 % to 24 % chemically combined water. The hydration reaction is chemically simple but it is strongly exothermic, with a heat generation of around 276 kcal/kg of CaO. The reaction is given below. Hence, 56 kilograms of CaO combines with 18 kilograms of water to produce 74 kilograms of Ca(OH)2. The ratio of hydroxide to CaO is 1.32. As per stoichiometric composition, calcium hydroxide contains 75.7 % CaO and 24.3 % H2O. Hydrated lime is produced when around stoichiometric amounts of water and lime reacts. It contains less than 1 % of free moisture and is handled as a powder. Slaked lime is produced on the other hand when quicklime is reacted with an excess amount of water to form lime slurry which is handled as a liquid. When heated to 512 deg C, the partial pressure of water in equilibrium with calcium hydroxide reaches normal atmospheric pressure, which decomposes calcium hydroxide back into calcium oxide and water. Due to the hydration process, hydrated lime is by necessity of fine particle size. Normal grades of hydrated lime suitable for most chemical purposes have 85 % or more passing a 200-mesh sieve, while for special applications hydrated lime can be obtained as fine as 99.5 % passing a 325-mesh sieve. At ambient temperature, calcium hydroxide dissolves in pure water to produce an alkaline solution with a pH value of about 12.4. At high pH value, the solubility of hydrated lime drastically decreases. Its aqueous solution is called limewater and is a medium strength base which reacts with acids. It can attack some metals such as aluminum while protecting other metals from corrosion such as iron and steel by passivation of their surface. Limewater turns milky in the presence of carbon dioxide due to the formation of calcium carbonate, a process called carbonatation. Important properties of hydrated lime are given in Tab 3. The CAS number of hydrated lime is 1305-62-0. Limestone is a very versatile mineral. It along with its lime derivatives (quicklime and hydrated lime) has a large number of uses. Various forms of lime are used in environmental, metallurgical, construction, and chemical/industrial applications, and more. The fastest growing use of lime is in environmental applications, where lime is used to comply with air, drinking water, wastewater, and solid waste regulations. Limestone is used as a construction material. It is used as a crushed stone for road base and railroad ballast. It is used as an aggregate in concrete. Powdered limestone is used as filler in the production of paper, paint, toothpaste, rubber, tiles, and plastics. Crushed limestone is used as a filter stone in on-site sewage disposal systems. Limestone and its lime derivatives (quicklime and hydrated lime) are used in building construction and have enormous importance for the industry. Calcined and hydrated limes are used in many industries to neutralize acid waste, and are used as caustic materials in the pulp and paper industry. In construction, the dominant use of lime is in soil stabilization for roads, earthen dams, airfields, and building foundations. Lime can be combined with certain additives to produce other metals and is also a key ingredient in mortar and plaster in lime slurry form. As an additive in asphalt, lime improves its cohesion, reduces stripping, and retards the aging process. There are additional chemical and industrial uses of lime, such as manufacturing chemicals and production of precipitated calcium carbonate. Lime is also used in gold recovery. In iron and steel industry, limestone and lime products are used as fluxing material both in ironmaking and in steelmaking. They have several other usages which include as a desulphurizing agent, water, water treatment, waste water (effluent) treatment, flue gas treatment, sludge and sewage treatment, and as a component of synthetic slag. Limestone powder is one of the most important fertilizers. Hydrated lime (either dry or as a slurry) has a number of miscellaneous applications in the manufacture of steel products. It is commonly used in wire drawing, acting as a lubricant as the steel rods or wires are drawn through dies, and in pig and slag casting in which a lime whitewash coating on the moulds prevents sticking. Lime is used to neutralize the acidic waste pickle liquor in which iron salts are also precipitated. After pickling, steel products are often given a lime bath to neutralize the last traces of the pickling acid adhering to the steel surface. Hydrated lime is also used to provide temporary corrosion protection in the form of a whitewash coating on steel products and to neutralize acid in coke by-product plants.